I know its been a long while, but I’ve not been myself lately. Firstly, I am now more involved with the community–attending my Neighbourhood Council’s Green Committee, signing up to become a member of Ocean View Farm, and seeing what other local steps we can take to help stop food waste from an individual consumer’s perspective. I stepped away from the computer and, more alarmingly, out of my home. I was also mulling on a new problem: how to create a zero-waste kitchen when all signs point to a serious rat problem in our new neighbourhood. No, I am not being paranoid. We saw them. First, on moving day, Pyx (one of our cats) and I were enjoying our new view when two brown/grey rats started frolicking in the patio below. I texted Jean-Francois and asked him to keep the compost bin in the garage, until I learn more. 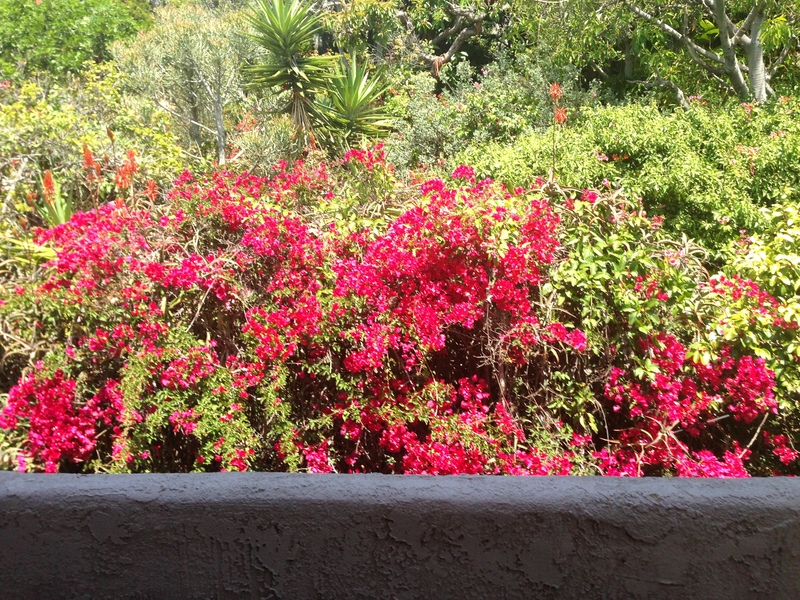 This is the garden view from our balcony. Several birds, butterflies, squirrels, and rats call this space home. Two nights later, Pyx is going nuts, asking to be let out and staring intently into the darkened air. Her fur ruffled, and tail fully puffed. Our Japanese Bob Tail was clearly excited. Three weeks later, Jean-Francois and I saw nine rats playing in the garden below. NINE. Nine, happy, fat, playing rats. Some brown, but most were grey. Clearly, pets and vermin had formed a colony. And the colony was thriving. 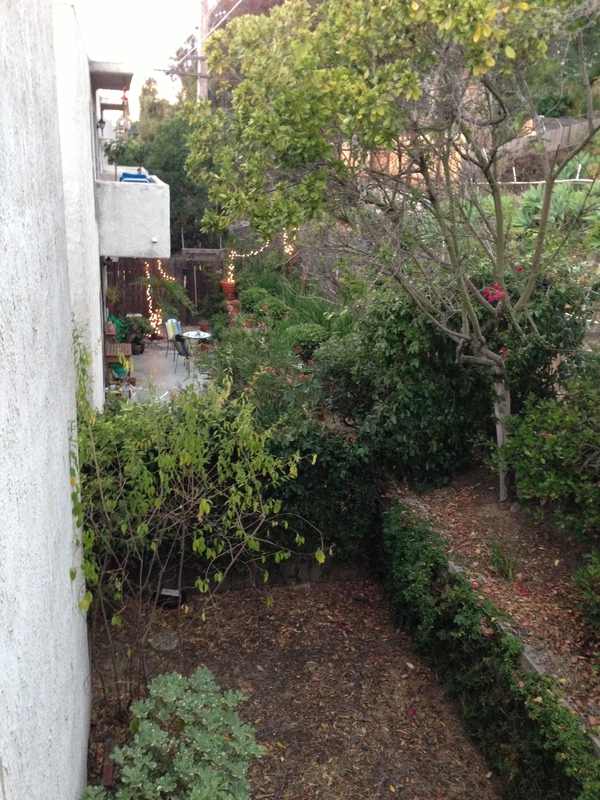 This is our view of the garden below. The corner that the rats enjoy. Note the lovely garden on the other side of the fence. That is the home of the squirrel-whisperer. It turns out, one of the other tenants feeds the squirrels. The rats benefit by eating what’s left. And we lose our composting option. Lest anyone suggests keeping the bin in the garage, it is not in the lease. I also suspect we might offend neighbours if we bring food scraps to a bin before our car as part of a nightly ritual performed by greenie-types who have gone off the deep-end. Before we resort to scaring our new neighbours, we need to control the rats and find a better way of saving our scraps from the bin. Hence I became civically active and started making friends with local groups. Santa Monica used take food scraps in bins, but they had to stop because of contamination. Apparently apartment dwellers are BIG liabilities–we are temporary residents with a weak connection to common goals. Elected officials work with the easy, visible winning programmes and blame tenants for failures. We are not invested enough, it seems. Yet, there are options. Inconvenient ones, but solutions that do show commitment. You see, it turns out, that people in downtown Los Angeles have chickens and gardens and want food scraps to keep both happy and healthy. I learnt this at the Mar Vista Farmers’ Market. And, my mind raced. There are possible solutions that will require keeping our kitchen compositor, only, we will need to find a new home for our beloved (now dormant) worms. The lesson I learnt about being more sustainably pro-active: Answers come when you step out of your door and start talking to your neighbours. The moral of my story: Be annoying and persistent. It works. This entry was posted in On food waste, Taking action and tagged compost, food waste, green living, Los Angeles, Rodent by Bonnie Lee. Bookmark the permalink. At least you have options. I would not be to pleased to see nine rats in the garden. I once saw a tiny mouse, but he did not last long with the garter snakes and hawks. I hope your worms find a nice place to reside. Good that you found a home for the kitchen waste! Feeding chicken faces is always an option and, unlike kids or worms, rarely complain or fuss about the menu. Gad you’re looking past the apartment for composting. We too are learning — and teaching — much with apartment dwellers. They are a different breed indeed, but no less worthy of the attention by others spreading the good [green] news. We are all in this thing together, Bonnie Lee. Cheers from the Texas heat. PS — what a view! There is nothing quite as unnerving as waking up hearing mice or rats, when a head appeared at the new hole in the floorboard left by the radiator installer. That was the last straw. Time to get a cat. Problem solved. Except now the cat brings fleas home….. aaarrrrrggghhhhh !